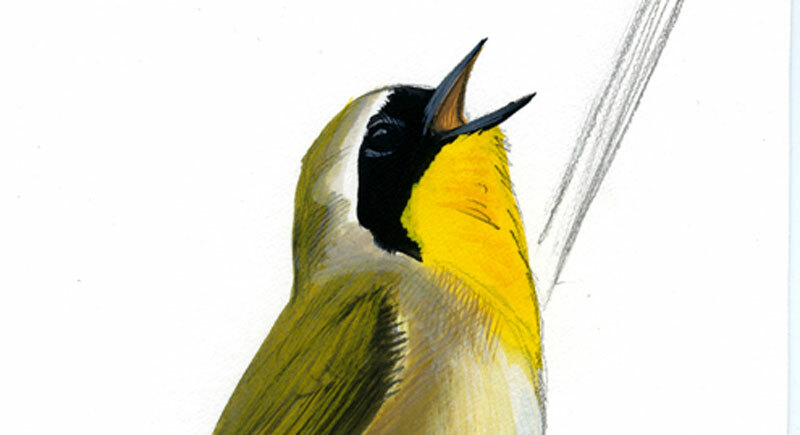 Detail of singing Common Yellowthroat, an original gouache painting by David Sibley. The auction for this painting will be closing in about 48 hours – at 9 PM Eastern time on Tuesday June 5th. You can see the auction and closing time in the sidebar to the right. This is a small gouache painting of a singing male Common Yellowthroat, which will be appearing here soon in a blog post about bird song. For more images and more details about the auction and the painting click this link. Check it out, and please share this with anyone else who might be interested. « Western Grebes can walk!